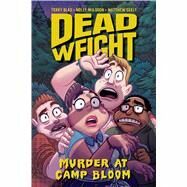 Deep in the Oregon wilderness sits Camp Bloom, a weight-loss camp where "overweight" teens can "get in shape." Jesse would rather be anywhere else, but her parents are forcing her to go. Noah isn't sure if he wants to be there, but it's too late to turn back. Tony is heartbroken at the thought of giving up his phone and internet. And Kate... well, she likes the hikes, at least. As far as these four teens are concerned, it's just another boring summer. Until one night, when Jesse and Noah witness a beloved counselor's murder. The body's gone by the next morning, but a blurry photo leads to one clue—the murderer is one of the camp's staff members! But which one? As Jesse, Noah, Kate, and Tony investigate, they quickly discover that everyone's got their secrets... and one of them would kill to keep theirs hidden. Molly Muldoon’s high school superlative was “Most Likely to Write Murder Mysteries.” Well played, yearbook staff. Molly’s a writer, editor, and newly-minted librarian who’s always on the move with her pawtner-in-crime, Jamie McKitten. She is co-writing a story in Chad Sell’s middle grade graphic novel Cardboard Kingdom, which is being published in 2018 from Knopf. Matthew Seely is an animator, illustrator, and comic artist from Portland, Oregon. He’s worked with ShadowMachine as Segment Director on Dancing in the Dark for season two of MTV's Greatest Party Story Ever, and has created multiple independent animated shorts. He’s also written, drawn and self-published comics including Robo-Boy vs. Boybot and Oswald the Orange. In his free time, Seely enjoys playing music, listening to podcasts, and eating peanut butter and banana sandwiches.